I have spent the last 10 years writing and giving lectures about how whiteness impacts ethical consumption and beyond in the USA. The number 1 theme of confusion I have encountered, about this topic of race and whiteness, is from mostly white people who literally do not understand how race and racialization are historically, socially, physically, geographically, and legally constituted. Most white identified people who have spent their formative years in the USA or other white dominated societies, seem to believe that race is simply a “skin color” with certain phenotypes like ‘blonde hair’ or ‘thin lips’ as race markers; even more so, most think racism is not a significant impediment to equity and inclusion, despite the rigorous post-2000 data showing otherwise. For this demographic, race is simply ‘skin color’ and basically a ‘thing of the past’…. …But nothing could be further from the truth. If race is just about ‘skin color’, then why have I constantly been told that I sound ‘white’? How can one possibly ‘hear’ one’s skin color? If race is only about skin color, then why were the Irish in the USA, up until the 20th century, not considered white like White Anglo Saxon Protestants, despite having the same skin color? How were they and other light skinned European immigrants able to work towards whiteness? If race is just about skin color, why was my newborn baby in 2009, who was born with very fair skin and bright blue eyes and straight brown hair considered to be ‘Black’ by some yet “White” by others? Notice: This is a draft work in progress and will grow over time….. Mainstream USA has a difficult time getting real about the complexities of race and power, its history, politics, etc; especially those who are racially privileged and never had to think about race. This toolkit was tailored from the original one, “Excerpt: Getting Real About Race“, which focused more on K-12 schooling experience. 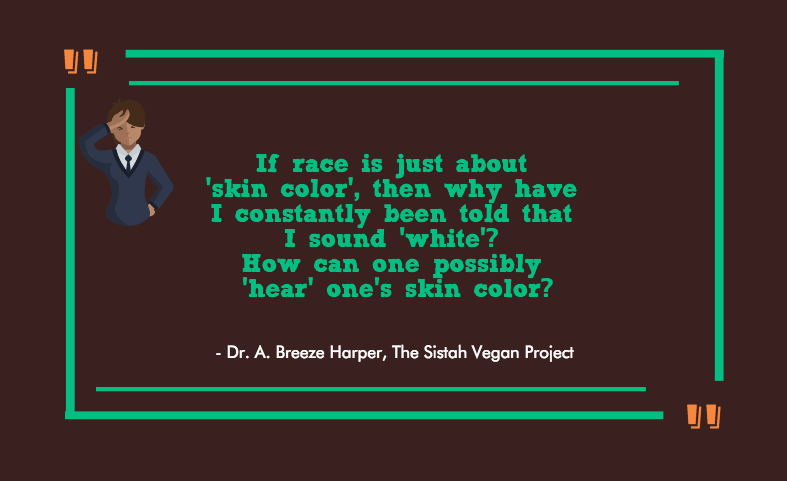 I will use this toolkit to provide questions to guide reflection and discussion on how the physical, social, legal and historical constructions of race impact those involved in the ethical consumption sectors, ranging from veganism, to animal rights, to ‘good food’. In Rac(e)ing to Class: Confronting Poverty and Race in Schools and Classrooms, H. Richard Milner IV writes, “Educators tend to struggle to address race and how it informs their work with students, parents, communities, and colleagues.” He proposes a nuanced way to conceptualize race as physical, social, legal and historical constructions. What follows are short excerpts from Rac(e)ing to Class and guiding questions that I adapted for ethical consumption. Please use these as tools for yourself as well as your community or place of work. How do the physical, social, legal and historical constructions of race affect the ethical consumption community that I am involved with? You can use the four questions as prompts for journal writing and silent reflection. Or, have the questions available to help facilitate a group discussion about race among colleagues. Or, you can do both. 1. Give an example of how race is physically constructed in ethical consumption. 2. How does the physical construction of race affect you personally or how your engage in ethical consumption? For example, ‘normal’ healthy bodies depicted on ethical consumption ads are almost always ‘white’ and skinny people. Why is it that we rarely, if ever, see darker skinned people and/or ‘fat’ people as the ‘benchmark’ for normal and healthy? How do both skin color and body size affect racialization into ‘proper’ whiteness? What other way does ‘proper’ whiteness impact ethical consumption? 3. How does the physical construction of race affect the demographics you are servicing and/or educating about ethical consumption? For example, why are darker skin people who are ‘fat’, targeted as needing to be ‘educated’ more about ethical consumption than white and skinny people? How and why does racialization play a role in intersections of skin color, body size, and ethics? 4. How does the physical construction of race impact the ethical consumption sector you are involved in? I would add that most people are completely unconscious about how their interpretations and perceptions are racially biased. 1. Give an example of how race is socially constructed in ethical consumption. 2. How does the social construction of race affect you as well as how you engage in ethical consumption or even receive its teachings? 3. How does the social construction of race affect the people you work with or service within your sector of ethical consumption? 4. How does the social construction of race impact your organization or business? 1. Give an example of how race is legally constructed in your life/culture/society. 2. How does the legal construction of race affect your engagement with ethical consumption? 3. How does the legal construction of race affect the demographics you primarily service or work with (i.e., clients, customers, students, patients, etc)? 4. How does the legal construction of race impact your organization or business’s construction of ethical consumption? 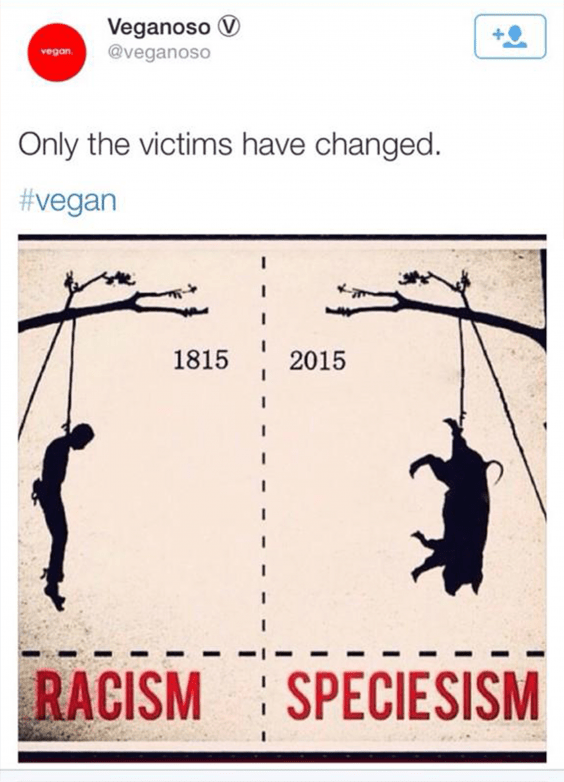 If you are involved in the animal rights and/or vegan movement, do you employ images such as the above without understanding that legally, Black people were never considered human but actually animals (in the Eurocentric speciesist and colonialist racist way), while the collectivity of white people were legally constituted as fully human? Are you aware that even though lynching Black people in the USA by using ropes and trees is illegal now, there are still legal ways to “lynch” Black people– most notably, racial profiling and deadly assaults by police officers who are still deeply impacted by the historical and legal common practices of traditionally lynching Black people? The image also implies that race and racism are no longer significant impediments to health, happiness, and safety in Black people’s lives. 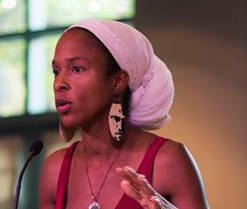 It also implies that those using this image have not read the comprehensive canon of post-2000 social science and legal studies that show that white USA mainstream still conceptualize Black people as animals and deserving of being “lynched”– albeit not from ropes and trees, but for being things like too ‘uppity’ towards the police like Sandra Bland supposedly was; or being shot when you are a 12 year old boy (Tamir Rice) because systemic negrophobia has created [un]conscious racialized bias in the minds of the mainstream population who believe a little Black boy can look like a threatening “big scary” Black man. There are a plethora of ways in which systemic racism negatively affects the legal system. Remember, systems are connected: the legal system impacts the health system, impacts the educational system, impacts the food system, etc. Race is historically and geographically* constructed. 1. Give an example of how race is historically constructed in your life/culture/society. 2. How does the historical construction of race affect you and your engagement with ethical consumption? For example, have you ever thought about the history of sundown towns and how it affects the geographical location of say, a permaculture event? 3. How do the historical, physical, and geographical constructions of race affect your place of work and/or activism’s inter-organizational dynamics around ethical consumption? For example, what are the thoughts around the ‘white male farmer’ as the uncontested ‘norm’ in the current mainstream depictions of food, sustainability, and farming? How do history and rural geographies play into race as well as who is the physically acceptable icon of ethical consumption? 4. 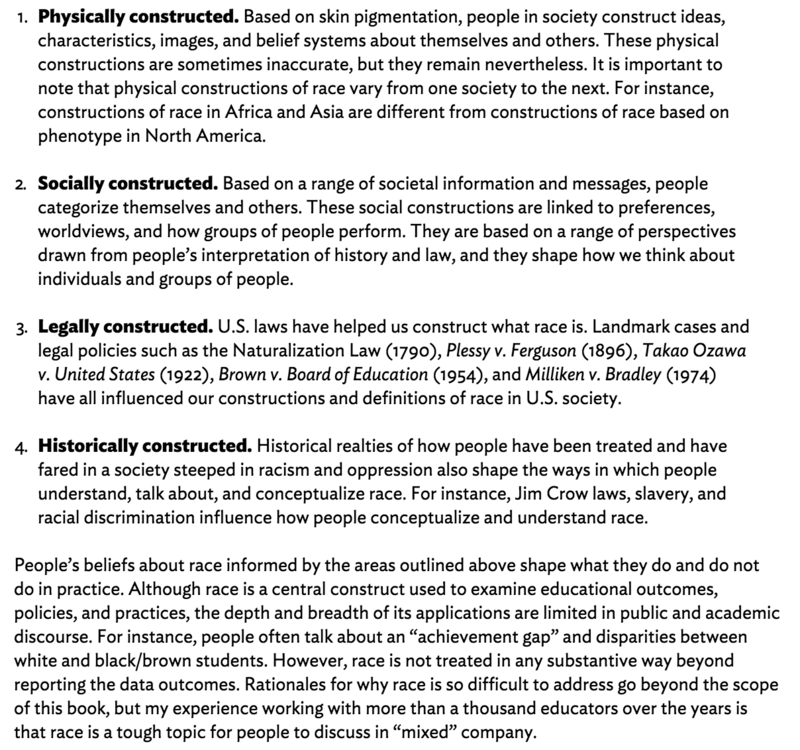 How does the historical construction of race impact your organization or business model’s sense of ethical consumption, educational outreach, and how they communicate? For example, the history of the US Farm Bill and its impact into the present were deeply impacted by systemic racialization. How racialized minorities have been treated within the agricultural sectors of the USA influence how the mainstream food system operates today…as well as maintain the racial and socio-economic inequities within it. To obtain ethical food commodities such as ‘kale’ or ‘strawberries’, one must understand the history of racialization and its impact on the farm bill…which impacts how these foods are farmed and how they get to the plate…which impacts how each individual involved in ethical consumption, conceptualizes what a ‘just’ food system should look like. If white people in the USA have historically to the present had safer, healthier, and easier access to food and medical resources, due to legal institutions of racism, how does this history affect your construction of how people can or should consume food in an ‘ethical’ way? Does this impact your communication model? Also, the System of Racial Inequity in which ethical consumption exists in can be better understood through many resources including the highly acclaimed video Cracking the Codes which is accessible here: http://crackingthecodes.org . No one person in this anti-racism work I am involved in has all the answers; this is a continuum and no one is a 100% expert on these difficult subjects. I have been ‘educating’ myself about systems of racial inequity for 20 years now (in terms of formal education) and I’m still am always learning and re-learning. Lastly, I will be writing more deeply about the above questions in my new book due out in 2016 or beginning of 2017 (see below). And check out SPLC’s entire Teaching Tolerance resources to adapt to your ethical consumption activism, scholarship, etc. Inquire about Dr. A. Breeze Harper lecturing or giving a workshop at your organization, school, or business. Dr. Harper currently manages the Staff Diversity Initiative’s Multicultural Education Program at UC Berkeley and is the founder of the Critical Diversity Solutions. Check her profile out on LinkedIn.